It seems like its been a while since we featured Zoé AKA Monster Pie Toys from France who is based in Tyne and Wear. A great time to present to you all “Louie”! Zoé whos well known for her designer plushes using needle-felted wool and clay is back with some resin figures. 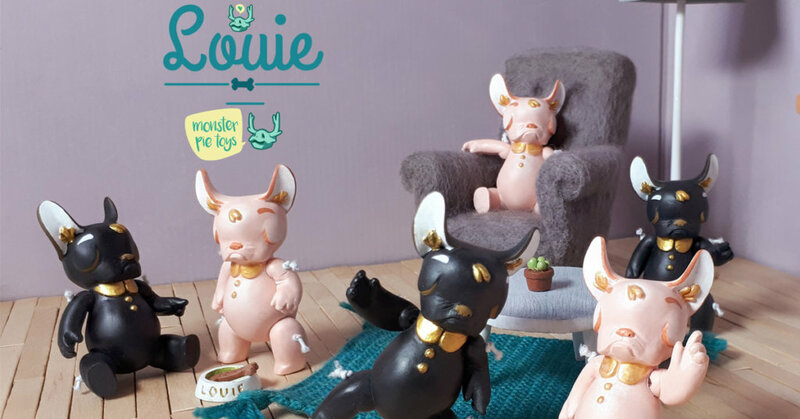 Louie is a handmade ball-jointed doll with moving arms and legs, standing at about 8cm (3 inches) tall, representing Zoé’s signature style in a resin figure form. Zoé is offering you the chance to adopt them and as a part of the launch, Zoé is taking orders for any colour you want of Louie! Each doll is lovingly hand-cast in the Monster Pie home studio using Jesmonite (a water-based, non-toxic resin). All joints are lined with felt to prevent scratches and help with grip for better posing. This first edition is very limited, only three of each colour. But there is also a made to order option for blank toys! Make sure you take a look at her blog monsterpietoys.com/blog it shows a lot of behind the scenes like her felting toolset and her DIY Sanding booth which could be useful to a lot of people. You can stay in touch with Monster Pie Toys via her Website, Shop, Instagram and Facebook.